There are things about you quite unlike any other. Things always known by your father or mother. So if you decide to be different one day, no worries… I’d know you anyway. Nancy Tillman is the author and illustrator of the New York Times-bestselling picture book, On the Night You Were Born; its companion journal, The Wonder of You; The Spirit of Christmas; Wherever You Are, My Love Will Find You (also a New York Times bestseller); and The Crown on Your Head. She also created the mischievous cat Tumford in Tumford the Terrible and Tumford’s Rude Noises, and illustrated It’s Time to Sleep, My Love by Eric Metaxas. Nancy lives in Portland, Oregon. Description: Join us to read the book and/or watch the film of classic works of literature. Book to be discussed - Amazing Grace by Eric Metaxas. Other Information:Beverages are provided and members take turns bringing treats. Library staff will assist participants in obtaining books for the discussion groups. Sign up at the Fiction, Movies and Music Desk at the library, or call 328-2305. Eric Metaxas (born 1963) is an American author, speaker, and TV host. He is best known for two biographies, Amazing Grace: William Wilberforce and the Heroic Campaign to End Slavery about William Wilberforce and Bonhoeffer: Pastor, Martyr, Prophet, Spy about Dietrich Bonhoeffer. He has also written humor, children's books, and scripts for VeggieTales. 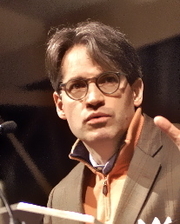 Metaxas is the founder and host of the NYC-based event series, "Socrates in the City: Conversations on the Unexamined Life" and the co-host of the nationally syndicated weekly Sunday morning program, "100 Huntley Street." Eric Metaxas is currently considered a "single author." If one or more works are by a distinct, homonymous authors, go ahead and split the author. Eric Metaxas is composed of 6 names. You can examine and separate out names.